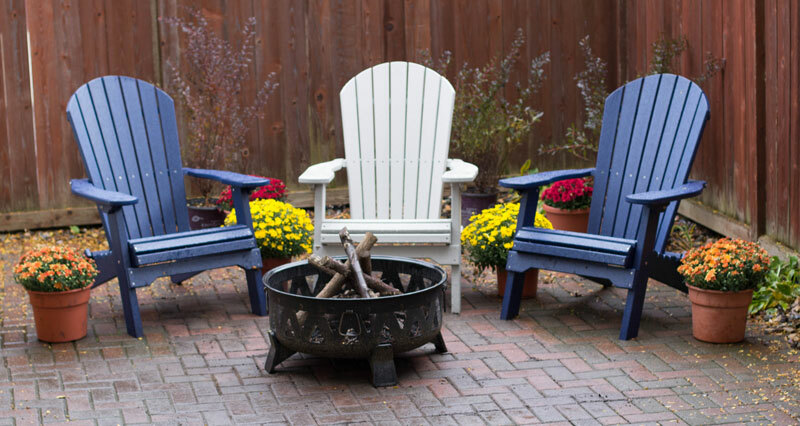 Q: What is Comfort Craft outdoor furniture made from? A: Comfort Craft furniture is made from recycled high-density polyethylene (HDPE) lumber, a durable, environmentally friendly alternative to traditional wood. The recycled material is a combination of consumer waste and industrial by-products normally disposed of in landfills. Q: Can Comfort Craft furniture be stored outside in the winter? A: Yes. Made from durable HDPE lumber, Comfort Craft furniture is maintenance-free. It has stainless-steel fasteners so it will not rust. It is not necessary to cover the furniture in the winter, and it can be hosed off with water in the spring. In coastal areas with saline environments, we recommend that stainless-steel fasteners are rinsed regularly to avoid corrosion. A: Comfort Craft furniture can be cleaned with plain soap and water. Avoid pressure washing and harsh chemicals. Q: Does the color run all the way through the furniture? A: Yes. The color is integral to the product. Q: Will the color fade? A: No. Comfort Craft furniture is fade resistant. Q: Will the furniture splint or chip? A: No. Comfort Craft furniture will not rot or splinter. It requires no sealing, painting or staining. It contains no fillers, such as wood fiber, which can absorb moisture and promote bacterial growth. Q: Is this the same product offered by other suppliers? A: Comfort Craft furniture is constructed from the same material, HDPE (poly) lumber, as some other brands of outdoor furniture. Compare, and you'll see that Comfort Craft furniture costs less than other available brands while delivering unbeatable comfort and quality. Q: Where it is made? A: Comfort Craft furniture is proudly made in the U.S.A. by experienced, skilled Amish craftsmen. A: Comfort Craft furniture comes with a limited warranty to the original purchaser, starting at the date of purchase, against structural failure for up to twenty (20) years for residential use and up to five (5) years for commercial use. Ask your Patio Town sales staff for details.